TEMPE, Ariz. — Nearly 1 of every 5 deaths is related to smoking. Cigarettes kill more Americans a year than alcohol, car accidents, suicide, AIDS, homicide and illegal drugs combined. Lung cancer has become the leading cause of cancer death among both men and women, and 87% of lung cancer deaths are caused by smoking. Several efforts have been implemented to help decrease this problem including a recent $500 million dollar anti-smoking campaign launched by billionaires Bill Gates and Mayor Michael Bloomberg. STG Media Corp. is doing their part to help fight the growing epidemic by launching the creatively designed smoking cessation product, Resolve. 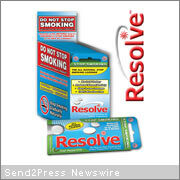 Resolve is the first, scientifically tested, all-natural antidepressant and smoking cessation lozenge. STG Media Corp has also repackaged the smoking cessation product in preparation for c-store distribution and will be launching this innovative product into 100,000 convenience stores over the next year. “We expect Resolve to thrive in the c-store channel, we have designed product packaging and a media campaign that will specifically cater to the c-store demographic and ensure a successful launch,” Lark said. Additionally, STG Media Corp will be launching an internet-selling-site that will make the smoking cessation product available to the online consumer. The media that Resolve will be running will drive consumers to the website to purchase the innovative product. The multi-channel marketing will offer customers more than one way to purchase Resolve, and ultimately increase the chances of acquiring a higher ROI. Please visit Resolve’s website at http://www.tryresolve.com. STG Media Corp., STG Retail Direct, and STG Interactive, LLC, work together to develop and execute strategic, national marketing campaigns. Based in Tempe, AZ, STG Media is a full-service advertising agency specializing in creative and media buying for print, television and radio. STG Retail Direct places products directly on the shelves of Wal-Mart, Walgreens, CVS, Target, GNC, and thousands of grocery and convenience stores nationwide. Helping clients to maximize their ad dollars, STG works hand in hand with STG Distribution Services, a master distributor and brand management company with capabilities to place products on the check-out counters in over 100,000 C-Stores in the USA with a proven market blitz program. STG Interactive develops cutting-edge E-commerce solutions in addition to search engine optimization and search engine marketing. STG helps clients navigate through the complex landscape of opportunities that exist within the context of modern, cross-media campaigns. For more information about the STG family of companies, call toll-free: 866-834-4370.